Crunchy shortbread cookies dusted with copious amounts of powdered sugar are an institution in my house around the holidays. 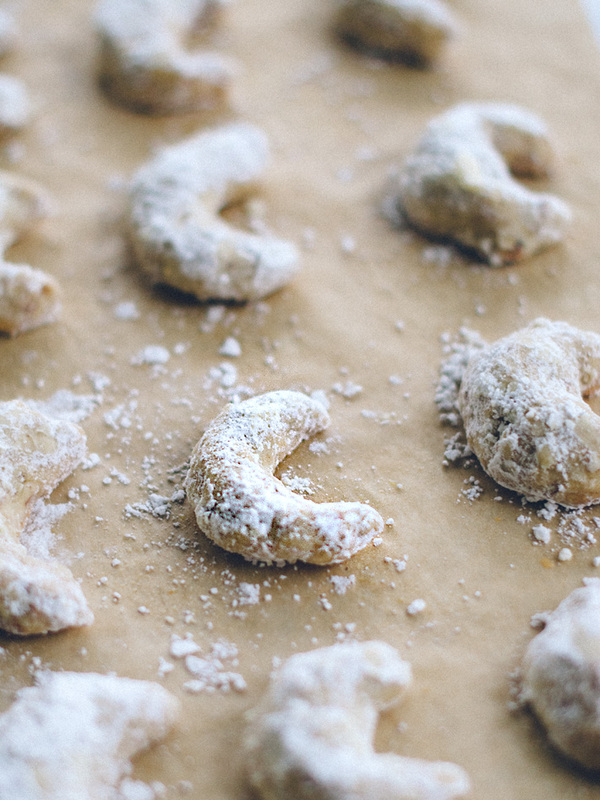 My mom always made Mexican wedding cake cookies or almond crescents every year growing up. As an adult, my mainstay recipe has been this Mexican wedding cake cookie one. However, I decided to change things up ever so slightly this year and go the almond route. 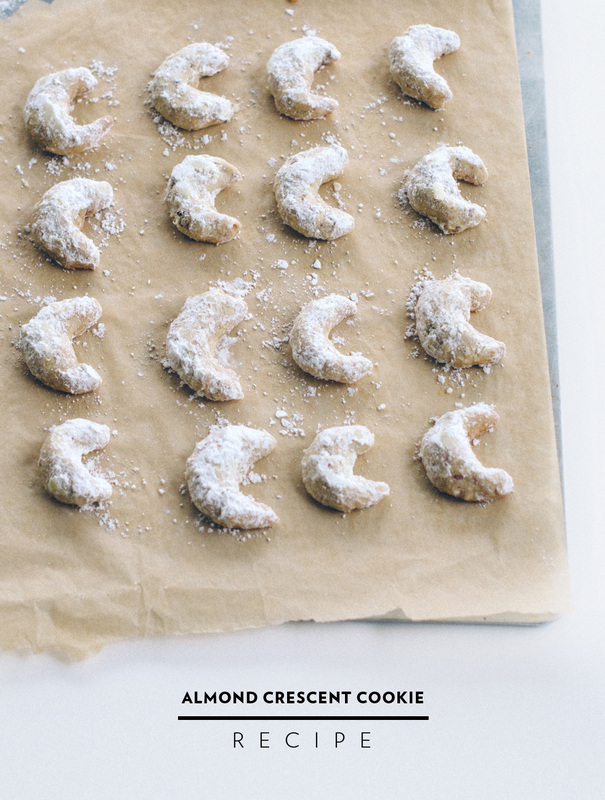 I'm sort of in love with their little half moon shapes. Also, I wanted to take a minute to wish you all a merry Christmas and happy holidays. I'll be taking a little break to spend time with family from now until just before New Year's. I hope you all enjoy your time with family and get a bit of rest. INSTRUCTIONS Using an electric mixer, beat butter on medium speed in large bowl until light and fluffy. Add 1/2 cup powdered sugar and vanilla; beat until well-blended. In a separate bowl, mix together flour, cinnamon and salt. Slowly add dry mixture to wet mixture, beating until well-blended. Mix in almonds with a wooden spoon. Form dough into a ball, and wrap in plastic. Chill until cold, about 30 minutes. While dough is chilling, preheat oven to 350 degrees. Roll dough with palms into roughly 1-inch balls. Roll dough balls in hands to create crescent shapes. Arrange the cookies on a large baking sheet lined with parchment paper. Bake cookies until light golden brown on bottom and just pale golden on top, about 12-14 minutes. Check cookies throughout baking to be sure not to over bake. If baked too long, bottoms will burn and cookies will be very dry. Cool cookies 5 minutes on baking sheet. Pour 1-1/2 cups powdered sugar in pie dish. Gently toss warm cookies in powdered sugar to coat completely. Transfer coated cookies to rack and cool completely. Roll cookies in powdered sugar again once cooled. Store airtight at room temperature. For extra powdered sugar on your cookies, save leftover powdered sugar and sift over cookies just before serving. Well, I've finally gone and actually done what I said I would do in my food styling post. I'm bringing a bit of my baking blogger days back and am starting up a food column that will be featured here from time to time. I thought I'd squeak in a last-minute Thanksgiving recipe in case anyone else still planning their menu. Who would be last minute, though, really? Cause I'm NEVER last minute. I hope you note the sarcasm in that little statement. I made this recipe last week for a Thanksgiving get together with some friends. It's very simple to make, but gets lots of compliments. 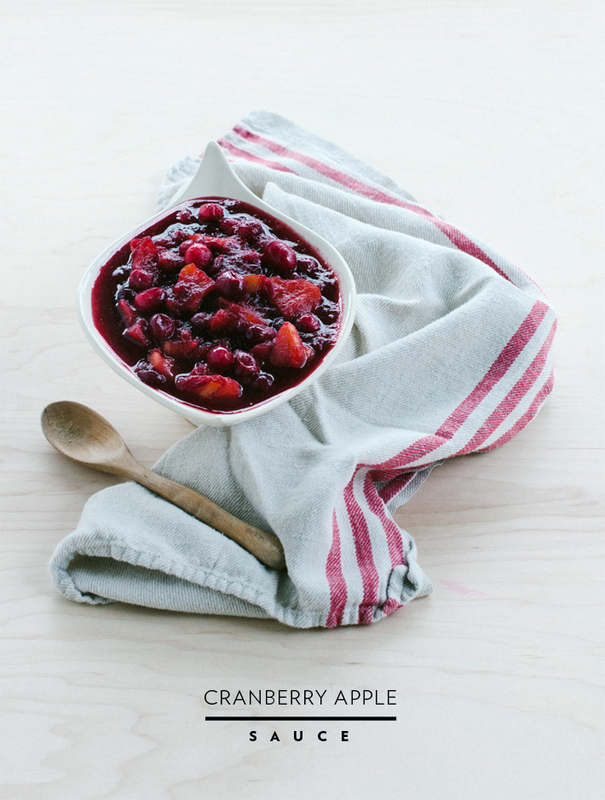 I think maybe because people are so used to eating the cranberry jello-like sauce out of the can that they really don't know what a good cranberry sauce can be? My mom always made this on cold nights when I was growing up, and it's always been one of my very favorites. INSTRUCTIONS Peel and cut apples into slices. Cut slices in half. Combine apples, sugar, cinnamon and water into a medium saucepan. Bring to a boil using medium heat. 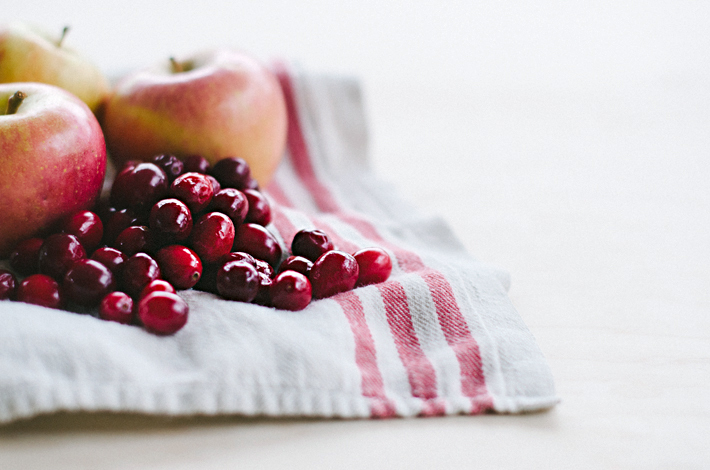 Add cranberries and return to a boil. Boil gently for 5-10 minutes, stirring occasionally. 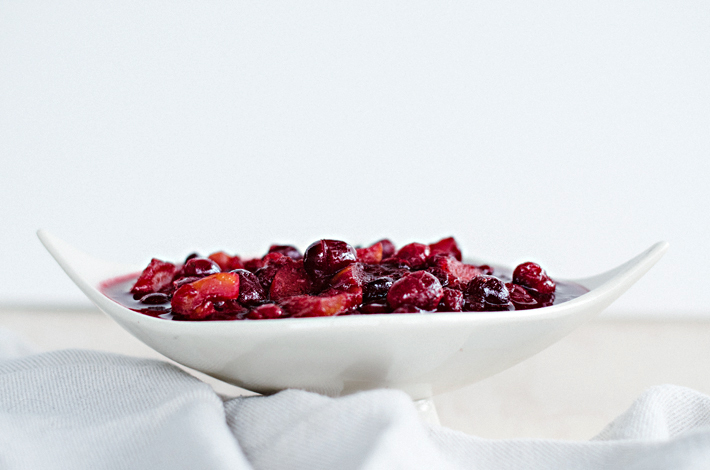 The sauce is done when the apples are tender and most of the cranberries have popped, but a few remain intact. Remove from heat. 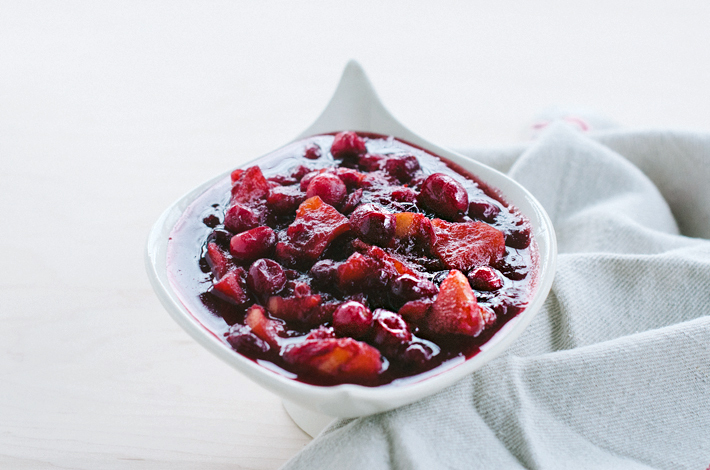 Let cranberry sauce sit for a bit to thicken, but serve while still warm.